Now we come to the Feast of Tabernacles, also called Booths and the Ingathering (Ex. 23:16, 34:22). This is the sixth annual holy convocation exemplifying God’s plan. “Thou shalt keep the feast of tabernacles seven days, after that thou has gathered in from thy threshing and from thy winepress. And thou shalt rejoice in thy feast, thou, and thy son, and thy daughter . . . seven days shalt thou keep a feast unto the Eternal thy God in the place which the Eternal shall choose; because the Eternal thy God shall bless thee in all thine increase, and in the work of thy hands, and thou shalt be altogether joyful . . . and they shall not appear before the Eternal empty; every man shall give as he is able, according to the blessing of the Eternal thy God which He hath given thee” (Deut. 16:13-17). The Feast of Tabernacles is to be kept for seven days, beginning the fifteenth day of the seventh month of God’s Sacred Calendar. “…Speak unto the children of Israel, saying: On the fifteenth day of this seventh month is the feast of tabernacles for seven days unto the Eternal. 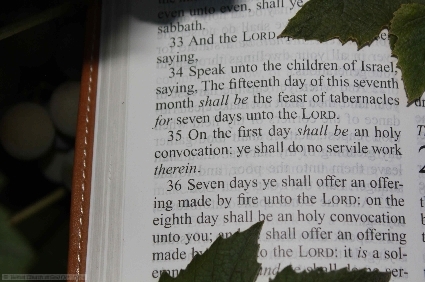 On the first day shall be a holy convocation; ye shall do no servile (typical customary) work therein” (Lev. 23:34-35). On the first of these days is a Holy Convocation—a commanded assembly. “and ye shall rejoice before the Eternal your God seven days…It shall be a statute forever in your generations: ye shall celebrate it in the seventh month” (Lev. 23:40-41). Here we begin to see culminating events in God’s great plan. After Christ has died for our sins to redeem mankind—after He has sent us the Holy Spirit and picked out a people for His Name to become kings and priests through the thousand years—after His glorious Second coming—after He has fully hallowed the saints by placing all sins upon the head of Satan, their real author, and separating both him and the sins from the presence of God and His people, thus enabling true peace, enabling us to be at-one with God—then we are ready for that final series of events, the commencement of the “Marriage of the Lamb,” the final actual making of the New Covenant, the establishment of the Kingdom of God on earth and the reaping of the great harvest of souls for a thousand years! This seven day Feast of the Ingathering (Ex. 23:16, 34:22) depicts the Millennium! To portray His Plan, God has used the yearly material harvest seasons in Israel to illustrate the spiritual harvest of souls. In Israel, there are two annual harvests. The first, is produced by the early (winter) rain, and is the spring grain harvest. The second, produced by the “latter rain,” is the larger overall harvest—the much greater fall harvest. In the 12th and 13th chapters of Zechariah is a prophecy of Christ returning—the reconciliation of the world commencing. Certain events resulting from fulfillment of the Feast of Trumpets and Day of Atonement are shown here (Zec. 12, Zec. 13). In Zechariah 14 the timeframe is the millennium. “The LORD shall be king over all the earth: in that day shall there be one LORD, and His name one . . . there shall be no more utter destruction; but Jerusalem shall be safely inhabited” (Zec. 14:9-11). This is, at last, the time when the “living waters”—Salvation—the Holy Spirit—”shall go out from Jerusalem” (Zec. 14:8). The waters are literal as well as figurative. We have seen that God often illustrates His spiritual plan by material events. In that day, when the earth is safely inhabited—when the Holy Spirit is granted to all human beings—what will happen? “And it shall come to pass that everyone that is left of all the nations which came against Jerusalem shall even go up from year to year to worship the King, the Lord of hosts, and to keep the feast of tabernacles” (Zec. 14:16)! Notice this 16th verse of Zechariah 14. After Christ returns, the nations, mortal Gentiles who have not yet received salvation, will come to Jerusalem to keep the Feast of Tabernacles! How could they keep a festival that was abolished at the cross? They could keep it only if it were commanded forever! And what will happen if they refuse to obey God? ”And it shall be, that whoso will not come up of all the families of the earth unto Jerusalem to worship the King, the Lord of hosts, even upon them shall be no rain” (drought!) (Zec. 14:17). The nations will keep the Feast of Tabernacles, from year to year, when Christ is ruling with a rod of iron! If the nations still won’t obey? “there shall be the plague, wherewith the Lord will smite the heathen” (Zec. 14:18). There are still heathen nations just beginning to learn the way of salvation—”that come not up to keep the feast of tabernacles. This shall be the punishment of all nations that come not up to keep the feast of tabernacles” (epidemic!) (Zec. 14:17-19). To obey God, to receive salvation, even the Gentiles will have to keep this Feast. Of course, for it is commanded forever! It is common to quote Isaiah 66:23, to show that the Sabbath will be kept in the millennium (as proof we must keep it now). When we read Zech. 14:16—showing that the Feast of Tabernacles will be kept during the millennium—will we be consistent, by keeping His Feast, and His holy convocations—His Annual High Sabbaths—today? Can we qualify as a Child of God—a king and priest—ruling with Christ on His throne, assisting Christ at that time, if we now refuse to keep this Feast? Christ kept the Feast of Tabernacles. John devoted an entire chapter of his gospel—the seventh chapter—to describe what Jesus said and did during the Feast of Tabernacles in the last year of His ministry (John 7:14-53). During the millennium, the Kingdom of God into which we may be born will rule the nations which are composed of mortal men begotten by the Spirit of God. The billions of mortals alive during the millennium will still be heirs to the Kingdom of God. They will not yet have inherited it as long as they remain mortal flesh, for “flesh and blood cannot inherit the kingdom of God” (I Cor. 15:50). “Ye must be born again”—”of the Spirit”—to inherit the Kingdom, said Jesus (John 3:7-8). Abraham, Isaac and Jacob were merely heirs when they dwelled on earth (Heb. 11:9). While heirs they dwelled in booths or tabernacles, sojourning in the land of promise. Booths, temporary dwellings, pictured that they were not yet inheritors. Thus we read of the Feast of Tabernacles that “Ye shall dwell in booths seven days…that your generations may know that I made the children of Israel to dwell in booths when I brought them out of the land of Egypt” (Lev. 23:43). Israel dwelled in booths in the wilderness before they entered the promised land. Those booths pictured that they were only heirs. Even during the millennium, when the Kingdom of God is ruling over mortal nations, the people will still only be heirs to the Kingdom. They must overcome their carnal nature and grow in knowledge and grace to inherit the promises. God says of Ephraim (a type of all Israel) that they will “dwell in tabernacles, as in the days of the solemn feast” (Hos. 12:9). Israel, in the wilderness, was a type of all people who must go through trials and tribulations to inherit the promises. They were wanderers, waiting to inherit the promises of salvation. A contention, held by some sects, that mortal human beings in the millennium will remain flesh and blood forever is plainly denied by the Feast of Tabernacles, for the Feast itself points toward an eternal inheritance. After Jesus gathers His Church, to Himself, and after He is seated on His throne where we will be ruling with Him, He will gather the nations before Him and say: “Come, you blessed of My Father, inherit the kingdom prepared for you from the foundation of the world” (Mat. 25:34). As a great day of Salvation, this span of one thousand years—the seventh thousand years—depicts a time of tremendous rest and peace, when the world will finally have Salvation as a near universal happening, “for the earth shall be full of the knowledge of the LORD, as the waters cover the sea” (Isa. 11:9)! “…in the days of these kings shall the God of heaven set up a kingdom, which shall never be destroyed: and the kingdom shall not be left to other people, but it shall break in pieces and consume all these kingdoms, and it shall stand for ever” (Dan. 2:44). “…I heard a loud voice saying in heaven, Now is come salvation, and strength, and the kingdom of our God, and the power of his Christ: for the accuser of our brethren is cast down, which accused them before our God day and night. …they overcame him by the blood of the Lamb, and by the word of their testimony; and they loved not their lives unto the death” (Rev. 12:10-11). “The wolf also shall dwell with the lamb, and the leopard shall lie down with the kid; and the calf and the young lion and the fatling together; and a little child shall lead them. And the cow and the bear shall feed; their young ones shall lie down together: and the lion shall eat straw like the ox. And the sucking child shall play on the hole of the asp, and the weaned child shall put his hand on the cockatrice’ den. They shall not hurt nor destroy in all my holy mountain: for the earth shall be full of the knowledge of the LORD, as the waters cover the sea (Isa. 11:6-9). “The wilderness and the solitary place shall be glad for them; and the desert shall rejoice, and blossom as the rose. It shall blossom abundantly, and rejoice even with joy and singing: the glory of Lebanon shall be given unto it, the excellency of Carmel and Sharon, they shall see the glory of the LORD, and the excellency of our God” (Isa. 35:1-2). “Behold, the days come, saith the LORD, that the plowman shall overtake the reaper, and the treader of grapes him that soweth seed; and the mountains shall drop sweet wine, and all the hills shall melt. And I will bring again the captivity of my people of Israel, and they shall build the waste cities, and inhabit them; and they shall plant vineyards, and drink the wine thereof; they shall also make gardens, and eat the fruit of them. And I will plant them upon their land, and they shall no more be pulled up out of their land which I have given them, saith the LORD thy God” (Amos 9:13-15). “And he said unto them, Unto you it is given to know the mystery of the kingdom of God: but unto them that are without, all these things are done in parables: That seeing they may see, and not perceive; and hearing they may hear, and not understand; lest at any time they should be converted, and their sins should be forgiven them” (Mark 4:11-12). “And it came to pass afterward, that he went throughout every city and village, preaching and shewing the glad tidings of the kingdom of God: and the twelve were with him…And he said, Unto you it is given to know the mysteries of the kingdom of God: but to others in parables; that seeing they might not see, and hearing they might not understand” (Luke 8:1, 10). “Now after that John was put in prison, Jesus came into Galilee, preaching the gospel of the kingdom of God, And saying, The time is fulfilled, and the kingdom of God is at hand: repent ye, and believe the gospel” (Mark 1:14-15). “And he said unto them, I must preach the kingdom of God to other cities also: for therefore am I sent. And he preached in the synagogues of Galilee” (Luke 4:43-44). ” . . . for thou wast slain, and hast redeemed us to God by thy blood out of every kindred, and tongue, and people, and nation; And hast made us unto our God kings and priests: and we shall reign on the earth” (Rev. 1:6; 5:9-10). “Verily I say unto you, That ye which have followed me, in the regeneration when the Son of man shall sit in the throne of his glory, ye also shall sit upon twelve thrones, judging the twelve tribes of Israel. And every one that hath forsaken houses, or brethren, or sisters, or father, or mother, or wife, or children, or lands, for my name’s sake, shall receive an hundredfold, and shall inherit everlasting life” (Mat. 19:28-29). “Wherefore come out from among them, and be ye separate, saith the Lord, and touch not the unclean thing; and I will receive you, And will be a Father unto you, and ye shall be my sons and daughters, saith the Lord Almighty” (2 Cor. 6:17-18). “Henceforth there is laid up for me a crown of righteousness, which the Lord, the righteous judge, shall give me at that day: and not to me only, but unto all them also that love his appearing” (2 Tim. 4:8). ” . . . when the Lord Jesus shall be revealed from heaven with his mighty angels” (2 Thes. 1:7). “Blessed is the man that endureth temptation: for when he is tried, he shall receive the crown of life, which the Lord hath promised to them that love him” (James 1:12). ” . . . when his glory shall be revealed, ye may be glad also with exceeding joy” (1 Pet. 4:13). ” . . . and also a partaker of the glory that shall be revealed . . . And when the chief Shepherd shall appear, ye shall receive a crown of glory that fadeth not away” (1 Pet. 5:1, 4). “Whereby are given unto us exceeding great and precious promises: that by these ye might be partakers of the divine nature, having escaped the corruption that is in the world through lust” (2 Pet. 1:4). There many unique aspects to this Pilgrimage Feast at the year’s end. Being a pilgrimage feast—involving travel and time away from home—it is understandable that it would be essential for there to be notable planning and preparation in order to partake of the Feast. Of the first Tithe, first tenth, God says “concerning the tithe of the herd, or of the flock, even of whatsoever passeth under the rod, the tenth shall be holy unto the LORD. He shall not search whether it be good or bad, neither shall he change it: and if he change it at all, then both it and the change thereof shall be holy; it shall not be redeemed” (Lev. 27:32-33) . This tithe is consecrated to the Lord, and is for the Levites, the priests, not for individual use, not for personal feasting. Yet “Thou shalt truly tithe all the increase of thy seed, that the field bringeth forth year by year. And thou shalt eat before the Lord thy God, in the place which He shall choose to place His name there, the tithe of thy corn, of thy wine, and of thine oil, and the firstlings of thy herds and of thy flocks; that thou mayest learn to fear the Lord thy God always” (Deut. 14:22-23). The first tithe was not for personal, individual, feasting. This now different “personal” tithe is called the second tithe. This brief summary regarding how individual families are able to afford attending the Feast, is not a full explanation of the three separate tithes and the purpose each individual tithe serves. But there is a separate tithe set-apart by God’s people to enable Feast attendance; assuring there are amble resources to facilitate travel and fully enjoy this special time of rejoicing. “And thou shalt bestow that money for whatsoever thy soul lusteth after, for oxen, or for sheep, or for wine, or for strong drink, or for whatsoever thy soul desireth: and thou shalt eat there before the LORD thy God, and thou shalt rejoice, thou, and thine household, and the Levite…thou shalt not forsake him…he hath no part nor inheritance with thee” (Deut. 14:26-27). “Seven days shalt thou keep a solemn feast unto the LORD thy God in the place which the LORD shall choose…the LORD thy God shall bless thee in all thine increase, and in all the works of thine hands, therefore thou shalt surely rejoice” (Deut. 16:15). Those who successfully set aside one-tenth of their increase, to be used for the Feast, will use this one-tenth of their annual income, for about one-fiftieth of the year. In round numbers, the tithe would be the amount of income normally used over a five week span. Though there is travel expense, and staying away is generally more expensive than staying at home, yet there is approximately a five fold increase in the available revenue or resources that one would normally live on during this time! This seeming lavishness is meant to typify the abundance that will exist in the world tomorrow. There will not be want or need at that time; for it will be a time of unprecedented abundance as the Word of God tells us. Such overall abundance also provides opportunity, today, to serve those who may be poor, less-fortunate, with few resources. 2) Not only is material abundance evident and reflected during this Feast—but there are daily sermons during the Feast; and there is continuous fellowship throughout the Feast. The spiritual richness and refreshment is abundant. One may hear more than a dozen messages—what might normally be one-fourth of a year’s worth of Sabbath sermons; so this week is indeed reflective of the time when “the earth shall be full of the knowledge of the LORD, as the waters cover the sea” (Isa. 11:9). The Feast of Tabernacles is a ”foretaste” of what life will be like in the world tomorrow under the perfect Government of God. It is designed to provide an experience for us that emulates life during the millennium—physically and spiritually—holistically. 3) The messages are likely to be focused on the Kingdom of God. The Gospel message, and what our calling is all about. How to overcome. How to fulfill God’s holy will, and how to assure that we will be meet and ready to serve Him, and serve with Him, in the Kingdom of God. This is what our life, and ultimately everyone’s life, is all about. Learning God’s right holy ways, willingly conforming our nature to be like His nature—of true character and the perfect love of our Lord and Savior. For the Firstfruits this is an exceptional opportunity; for the sermons should increase our understanding and realization of all that we have to overcome in this life—and how to do it—that we may be better equipped to help and assist and teach others in the world tomorrow—in the Kingdom of God—which is what this Feast represents! For the youth, this is a learning, growing, character building opportunity. It is never to early to learn (Luke 2:42, 46-47)! 4) As Firstfruits—as part of God’s Church in these last days—we learn more about God’s holy plan, and about end-time events as revealed throughout His holy Word and through the book of Revelation. This is to assist us to understand—to be ready for the difficult times to come—and be spiritually astute and prepared so that we will not be deceived or affected by the many fraudulent “prophets” and false “Christs” and lying-concepts to come on the scene. 5) Ultimately this is all part of our preparation; to be able, enabled, fully equipped, to serve with Christ in His Holy Kingdom! Do We Understand? Can We Understand? How vital, of such incomprehensible importance and magnitude, it is to be a Firstfruit unto God—and to be preparing, and to be prepared, to enter into His Kingdom? To receive eternal life, and to be made like unto God for “Beloved, now are we the sons of God, and it doth not yet appear what we shall be: but we know that, when he shall appear, we shall be like him; for we shall see him as he is” (1 John 3:2)! What will it mean to assist Christ in the redemption of all of humankind, earnestly begun at the onset of the thousand years? “May (we) be able to comprehend with all the saints what is the width and length and depth and height—to know the love of Christ which passes knowledge; that (we) may be filled with all the fullness of God” (Eph. 3:18-19 NKJV). May we “bow (our) knees unto the Father of our Lord Jesus Christ, from whom the whole family in heaven and earth is named” (Eph. 3:14-15 NKJV). May He grant us “according to the riches of His glory, to be strengthened with might through His Spirit in the inner man; That Christ may dwell in (our) hearts through faith; that (we), being rooted and grounded in love” may truly fulfill God’s holy will (Eph. 3:16-17). God “is able to do exceedingly abundantly above all that we ask or think, according to the power that works in us” (Eph. 3:20). May we be “knit together in love, and attaining to all riches of the full assurance of understanding, to the knowledge of the mystery of God, both of the Father and of Christ” (Col. 2:2). It is fitting, since this represents the fulfillment of what the Gospel is all about. But again, how does this compare with what the world typically claims to understand or embrace? For the western world today, Christmas is seen as the largest holiday of the year. And yet, again, it is based on false teachings and erroneous concepts. “Thus saith the LORD, Learn not the way of the heathen, and be not dismayed at the signs of heaven; for the heathen are dismayed at them. For the customs of the people are vain: for one cutteth a tree out of the forest, the work of the hands of the workman, with the axe. They deck it with silver and with gold; they fasten it with nails and with hammers, that it move not. They are upright as the palm tree, but speak not: they must needs be borne, because they cannot go. Be not afraid of them; for they cannot do evil, neither also is it in them to do good” (Jer. 10:2-5). The Yule logs and holly on the fireplace mantel are of pagan tradition and origin. The time of year for “Christmas” is taken from sun/solstice worship and pagan tradition. While it is cloaked as the supposed time Christ was born, yet the simple truth is that He was born in the fall, around the Feast time, and died in the spring, on Passover, at thirty three and one-half years of age. Considering the richness of the Truth (vs. the world’s traditions), realize the Truth, The Gospel, is of priceless eternal value— ultimately reflecting the very purpose for this life, this human experience, and all that God desires humankind to learn and gain as we grow, and overcome, and become, more like Him, through the putting on of His holy divine nature (2 Pet. 1:4). How could anyone knowingly embrace this world’s counterfeit traditions—when the Truth of the Gospel of the Kingdom of God—its ultimate powerful outcome, priceless purpose and infinite value—stand in such stark contrast to this world and its ways? For the sake of eternity—for eternal and infinite peace—may God help us to fully understand and embrace His phenomenal truth, and be partakers in His holy perfect plan—that all of humankind may ultimately learn the true lessons of this life, and write those lessons into their individual hearts and minds; that they may Live and experience the true abundance that only proceeds directly from God, through oneness with Him!